EDINBURG — Whenever Valeria Tapia is in the starting lineup for a UTRGV women’s basketball home game, the university’s public address announcer reads her player intro in Spanish. The twist is refreshing for Tapia, reminding her of growing up in Matamoros and playing with Mexico’s youth national teams. 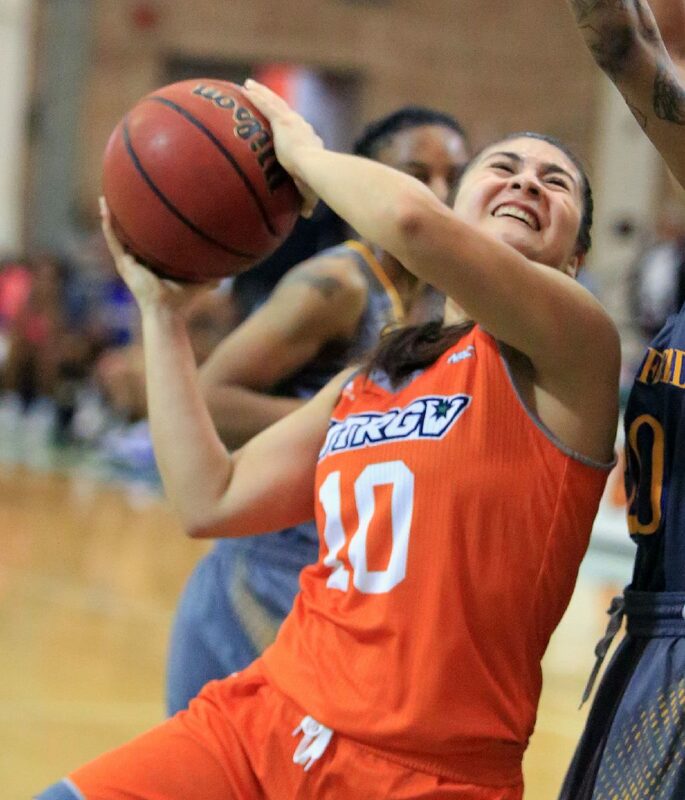 A freshman point guard for UTRGV this season, Tapia listed speaking in English as the biggest challenge she faces in playing at the Division I level. At least during her intro, she doesn’t have to worry about it. Tapia will hear her name called again at 7 p.m. tonight, as the graduate of St. Joseph Academy in Brownsville is expected to be in the starting lineup when UTRGV hosts Seattle U at the UTRGV Fieldhouse. The start will be Tapia’s 10th this season, and on the year she is averaging 3.7 points and 3.3 assists in 17.7 minutes per game. Before starting at UTRGV, Tapia had lived in Mexico all her life, making the short commute across the border to St. Joseph each day. She first started going to school in the United States when she entered seventh grade. Tapia said she took classes in English and was only formally instructed in the language through extra reading courses. Mostly, she learned through immersion. Though many of her high school classmates and friends at UTRGV speak Spanish, she says few, if any, of her basketball teammates are fluent in the language. As a result, she speaks English almost exclusively, which is occasionally a difficult habit to maintain on the court. UTRGV plays its home games about an hour drive from where Tapia grew up, so she said her family is at almost every game. She’s also had the opportunity to play with Mexico’s U19, U18 and U17 national teams, with games and tournaments taking her to Italy and Chile, among other places. Tidwell noted that the international game is played with a 24-second shot clock, which helped Tapia learn how to distribute the ball quickly and to the correct teammate. Tapia said her teams often struggled to win — an experience that has proven useful as UTRGV is off to a 1-8 start in WAC play this season. Tapia has been slowed slightly by an Achilles tendon strain and missed some time earlier in the year due to illness — part of a litany of injuries plaguing UTRGV. Tidwell said guard Nichele Hyman has had lower back problems, center Laura Van Tilburg’s status is unclear due to a knee injury, and guard Idil Turk will not play tonight because of a concussion. Still, Tidwell said he believes his team can play like the group that got off to the best start in program history at 9-2 rather than the unit that is 2-10 since.